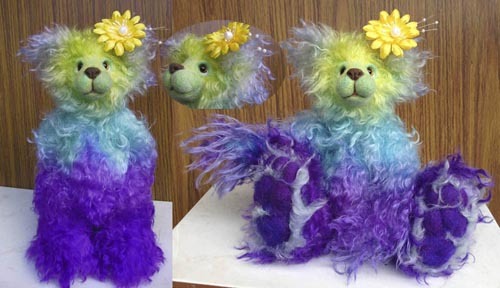 This beautiful girl has been hand dyed and then given lovely needlefelted paws and facial features. She was hand sewn throughout and has a pouch containing steel shot in her tummy to give her added weight. Materials I used a beautiful white Shulte curly locks that I then hand dyed a pale lime green to turqoise to purple. She is polyester filled but there is a sack in her tummy containing steel shot to give added weight. She had sparkling hand painted glass eyes, a needlefelted nose that has been treated to give a harder feel than normal needlefelting. She also has a needlefelted face, perle thread mouth and needlefelted paw pads.